From very early on in his career Edvard Munch aimed to convey the angst and isolation characteristic of modern man. Evening reflects these interests. It is considered to be the artist’s first treatment of the subject of melancholy and also looks forward to his more characteristic Symbolist compositions. Munch used his sister Laura as a model on numerous occasions. 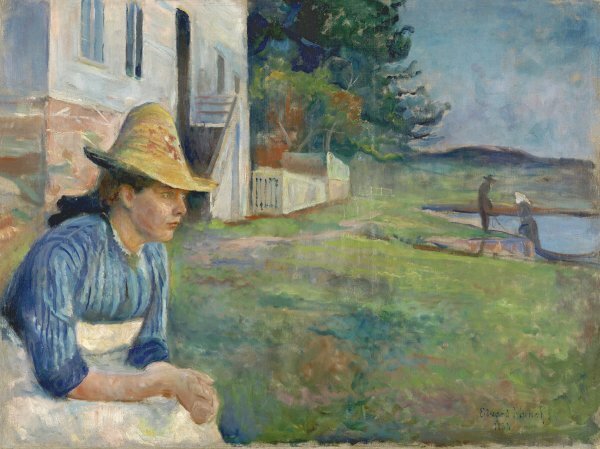 In this canvas she is depicted seated and in profile, in front of the house on the Norwegian fjord where they spent the summer of 1888. Her body occupies the foreground, albeit located on the far left-hand side and truncated at the bottom and on the left side. Laura gazes towards the fjord, whose waters are to be seen on the far right, but shows no interest in the two country people who have hauled in a boat in the middle-ground. Munch originally painted in two more figures but later eliminated them in order to emphasise the solitude of the principal figure. At the end of the 1880s the work of the young Edvard Munch was shifting away from the naturalism — sometimes inspired by the painting of Bastien-Lepage — and social realism of the early period and towards French Impressionism, to which the artist would add a Symbolist and Expressionist component. In summer 1888 Munch travelled with his painter friend Karl Dornberger to the Norwegian village of Vrengen, where he produced this portrait of his sister Laura. Protected by a straw hat, the melancholic girl with an absent expression, approaching the onset of her future schizophrenia, is seated in profile to the left of the foreground next to a house by the shore, where two figures can be glimpsed in the distance. The positioning of Laura in the foreground off centre and isolated from the background landscape ushers in a new device that Munch went on to use regularly in later paintings to emphasise emotional tension — a tension that is further heightened in the present painting by the light of dusk. The undulating coastline, characteristic of Kristiania Fjord (now Oslo), also foreshadows later compositions, such as the portrait of his other sister Inger at the Coast, painted at Asgardstrand in summer 1889. In both portraits Munch attaches equal importance to figures and landscape, following a compositional scheme that would characterise much of his oeuvre. However, as can be seen in the X-radiographs of Evening, Laura was originally not alone. Munch had included two other people in the composition: a woman in the centre and another figure climbing the steps up to the house. By eliminating them, he not only increased Laura’s solitude but also succeeded in intensifying the dramatic force of the scene. Although more obviously Impressionist in technique, Sisters in the Garden is directly related to the initial composition of the painting in the Museo Thyssen-Bornemisza collection, as it features a female figure standing behind Laura and attired in the same dress and hat.